Who was the real king of rock ‘n’ roll? Elvis the Pelvis? Or The Killer – Jerry Lee Lewis? 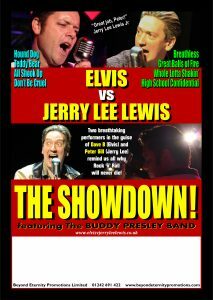 You can once again decide as The Showdown is called back into theatres due to public demand. Audiences will be excited once more by the sheer energy of Elvis’ hits such as Hound Dog, All Shook Up, Don’t Be Cruel, That’s Alright Mama, Blue Suede Shoes ,Heartbreak Hotel and Teddy Bear and Jerry Lee Lewis’ hits such as Great Balls of Fire, Whole Lotta Shakin’, High School Confidential, Roll Over Beethoven, Wild One, What I’d Say and Breathless. Then when the show is over, the audience will choose once and for all who was the true king and invite him back for one final curtain call. Two breathtaking performers in the guise of Dave B (Elvis) and Peter Gill (Jerry Lee Lewis) and supported by their phenomenal band remind us all why rock ‘n’ roll will never die!